A young mangrove plantation at the the Thousand Islands National Marine Park by the shore of Pramuka island, north of Jakarta, in 2010. 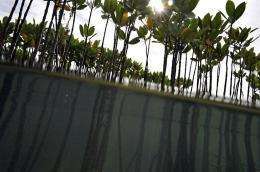 Mangroves, which have declined by up to half over the last 50 years, are an important bulkhead against climate change, a study released on Sunday has shown for the first time. Mangroves -- whose twisted, exposed roots grace coastlines in more than 100 countries -- confer many benefits on humans living in their midst. Another major "ecosystem service," in the jargon of environmental science, is protection from hurricanes and storm surges. Cyclone Nargis, which killed 138,000 people in Myanmar in 2008, would have been less deadly, experts say, if half the country's mangroves had not been ripped up for wood or to make way for shrimp farms. Daniel Donato of the US Department of Agriculture's Forest Service in Hilo, Hawaii and an international team of researchers examined the carbon content in 25 mangroves scattered across the Indo-Pacific region. "Mangroves are among the most carbon-rich forests in the tropics," Donato and his colleagues said in the study, published in Nature Geoscience. "Our data show that discussion of the key role of tropical wetland forests in climate change could be broadened significantly to include mangroves." In a companion commentary, Steven Bouillon from the Katholieke Universiteit Leuven in Belgium said the carbon inventory uncovered by the study "provides a strong incentive to consider mangrove ecosystems as priority areas for conservation." Hmm, Interesting article, makes sense, given mangrove ecosystems. Reckon I could, just need pattern matching masks and white space strippers. Trees should be cut down and turned into lumber before they die. If they die and rot, all the sequestered CO2 is released into the atmosphere. If they are turned into lumber, the CO2 is fixed and not released. Just filter out anything that has more than a certain ratio of $-signs to text. Time and time again scientists proved a long time ago trees are not the carbon sinks that they were portrayed as in elementary school. Respiration is a process that HAS to happen in all organisms that we consider alive and that process uses O2 and releases CO2. And when the tree dies it releases all the trapped CO2 in its wood,trunk,leaves, whatever you want to call it through decomposition. "Dancing Unicorns are an important bulkhead against climate change..."
Just as believable, equally factual, and a whole lot easier on the eyes and ears. I want a dancing unicorn, I'll trade you a nice bridge you can live under. TehDog: I'm not a troll. I'm probably a jerk sometimes, maybe even a sarcastic one - I hope not but I have to admit it is a possibility - but troll? Never. And I'm sorry to say that I'm all out of dancing unicorns. I'm expecting a new shipment in, however, right around the same time AGW is rigorously scientifically verified to my satisfaction.